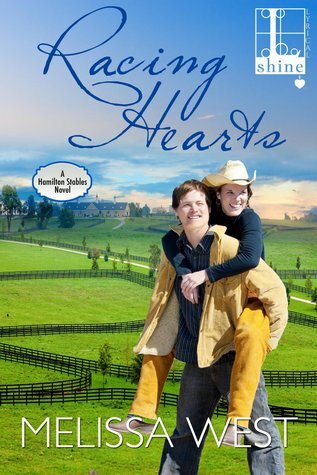 Melissa West has really found her niche in writing sweet contemporary romances. Her books are guaranteed to put a dreamy smile on your face and you can't help but fall in love right along with the characters. I felt the same with this book, the first in her new Hamilton Stables series. The second chance romance, the small town feel, and the thrill of rediscovering your passion all come together to infuse this story with life. I did feel the story took a bit to get going though. There is quite a bit of internal debate over making the right choices on both Emery and Trip's parts. After a racing accident, Emery has not ridden a horse since and instead of her parents being supportive and encouraging her to get back on the horse, they shelter and baby her. Emery is an only child and she is close to her parents, and especially wants their support and approval. It doesn't sit right with her that she's going behind her father's back to ask Trip Hamilton to take her on as a jockey. Trip also has his own inner battle to fight. Having been involved with Emery when they were younger, he is taking quite the risk to bring her on as a jockey. For one, she hasn't been back on a horse since the accident, and two, he isn't prepared for all of those old feelings to resurface. I wanted more build up with them, as it takes more than half of the book for them to finally kiss. They spend a lot of time in their own heads and it felt a bit repetitive. Once they finally DO get their heads screwed on straight and stopped worrying about everyone and everything else but the two of them, we were in business. Emery and Trip are really a great match for one another and I'm glad they had some really great people in their lives to remind them of that when things got tough. I liked Kate, Emery's best friend, a lot, as well as Trip's brothers, Nick and Alex. Annie-Jean and Patty were also great characters and I thought their rivalry was too much fun. I wasn't crazy about Emery's father though. I understand his fears, but for him to completely ice her out like he did just seemed extreme. I felt their reconciliation happened too fast and I would have preferred seeing Trip and Mr. Carlisle's conversation and seeing her father realize that he was making some seriously bad choices where his daughter was concerned. Instead, we get an apology and that he's proud of her, and I just wanted more there. I am glad for the way Trip and Emery's story concluded, though I think I would have liked seeing some more flashbacks from when they were younger. I think it could have added a bit more depth to the story to see young love at its peak and strengthened the second chance romance aspect. Overall, I thought this was a good start to a new series and I am looking forward to Alex's book next! I agree with you completely on this one. I thought the internal debate from the two of them in the beginning did make it have a bit slower of a start and the whole thing with her father drove me nuts. I really thought he should have had to do more to apologize because I really thought he was the one in the wrong BUT I did like Trip and Emery together and I thought this one was super sweet. Great review! I usually enjoy her books a whole lot, but I don't know if this one would be for me. That cover is really off-putting for some reason. It does sound like it had a sweet romance though so maybe I will try it. This does seem cute. I'm glad you enjoyed it, even if it took a bit to get going.